Matterbridge was designed to help out in exactly these scenarios. As the name already implies, it acts as a bridge between different providers (namely IRC, XMPP, Gitter, Mattermost, Slack, Discord, Telegram, Rocket.Chat, Hipchat (via xmpp), Matrix, Steam, ssh-chat and Zulip) and will relay messages and files posted in e.g. Jabber to Mattermost. This blog will explain how to install matterbridge and will configure matterbridge to mirror a specific channel within Mattermost. The latest version of matterbridge can be downloaded from the Github releases page of matterbridge. As an alternative to running the above binary, matterbridge can also be run through Docker. Before matterbridge can run we need a basic configuration. A dedicated service account in Mattermost needs to be created first. The following commands will create a service account called “matterbridge”. When executing the commands below, make sure to choose a pre-created random password for the “matterbridge” and note it down for later. 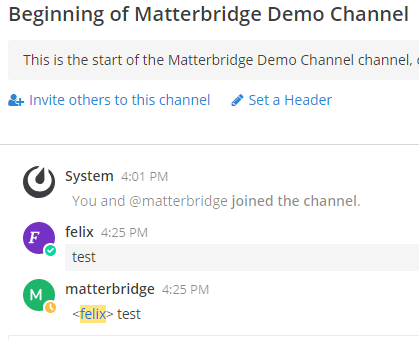 mattermost-platform channel create --team Univention --name matterbridge1 --display_name "Matterbridge Demo Channel"
mattermost-platform channel create --team Univention --name matterbridge2 --display_name "Matterbridge Demo Channel (mirror)"
With a user and channels now available we can create a configuration file for matterbridge. The example configuration below is hopefully pretty self-explanatory. Make sure to adapt the values such as Server, Team, Password and channel to your local environment. I recommend storing the configuration for example in /etc/matterbridge. #Use a dedicated user for this and not your own! With a user and the configuration in place, we can start matterbridge for the first time. The command below will start matterbridge in the foreground and as long as matterbridge is running messages will be mirrored between the configured channels. When running Mattermost and matterbridge on a Univention Corporate Server (UCS) setup is a lot easier, as installing the app will already take care of creating the matterbridge user and an example matterbridge.toml for you. To modify the Matterbridge configuration after the initial installation you need to modify the file /etc/matterbridge/matterbridge.toml. Since Matterbridge does not auto detect changes to its configuration you need to restart the app by issuing systemctl restart docker-app-matterbridge.service. More information on running the app is displayed in a “readme” file after the app has been installed. 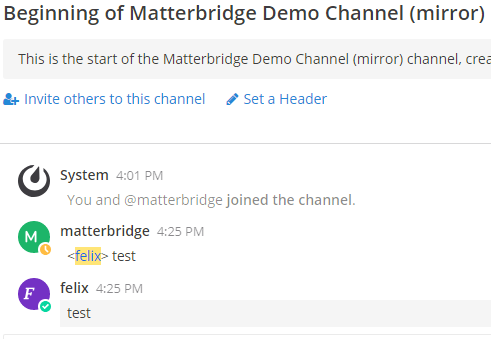 You now have a very simple demo setup where matterbridge is mirroring all Messages from one channel to another channel. Please check the matterbridge Wiki on how to configure matterbridge to connect to your local chat or ChatOps platforms and Mattermost at the same time. Want to learn more about matterbridge? Let us know in the comments or contact us via info@kopano.com.